I found jars of mole and adobo paste in the pantry. They expired a long time ago but that didn’t stop me from re-hydrating a jar with home made vegetable broth and making a dish with tofu. Using prepared mole paste makes the process easy. Layer drained and washed black beans, cut corn and cubes of firm tofu in a casserole. 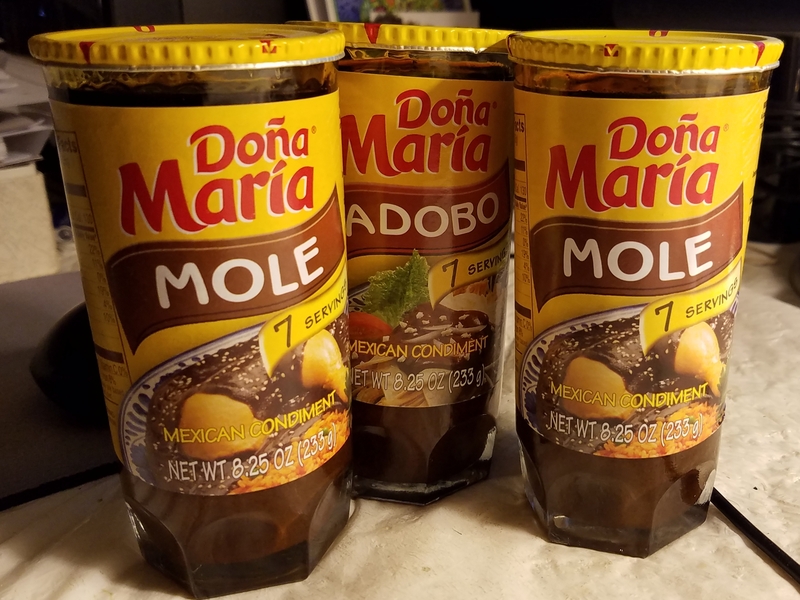 Next, pour mole sauce all over and bake in a 375º oven until thoroughly heated and bubbling, about 35 minutes. Top the casserole with sliced green onions and fresh cilantro if available. Spoon the mixture on brown rice to make a satisfying meal. This is not a recipe as there is no intent for readers to prepare the dish. I’m capturing a moment in time. I’m not even sure I will make Tofu Mole again once the jars of paste are used up. It’s another idea on the current excursion into Mexican flavors. It is all uncharted territory and that makes the journey engaging. This entry was posted in Cooking, Home Life, Local Food and tagged cooking, homelife, local food. Bookmark the permalink.